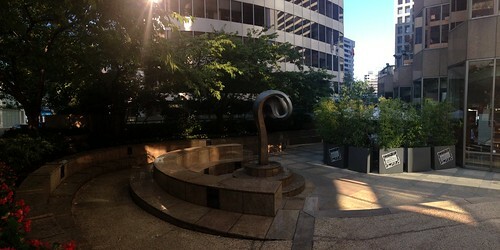 Description: The main space of this plaza is located to the west of the Grosvenor Building at 1040 W Georgia. From the Georgia side, there is a pathway that opens up to a plaza along Alberni St. 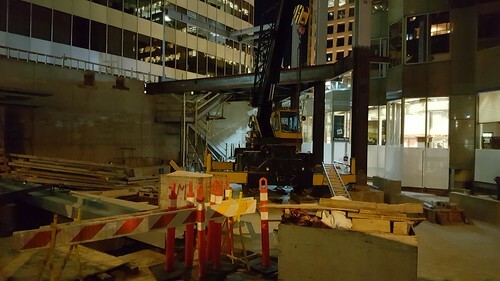 The plaza is more readily accessible from the Alberni side and can be entered via aprominent ‘spiral’ access ramp that runs along the western edge, or via generous stairs to the east. Generous landscaping runs along the south and western edges, helping to define and shade the space. At the centre a curving bronze sculpture called “Space Ribbon.” Windows from the adjacent tea shop look onto the plaza, and the space is further enclosed by a series of moveable planters. Locational Context: Surrounded by office towers on 3 sides, orienting the site to the south (Alberni St). The plaza is located on a street with high-end retail and restaurants. The Urban Tea Merchant, a pricey but popular café, faces onto the plaza. Pathways: Yes on both side of plaza, one along Alberni street other cutting through plaza to Georgia St.
Public Art: Yes. Sculpture: Roy C. Lewis: Space Ribbon. Plaza was constructed in 1984. Plaza was demolished in July 2016 and will be replaced with a two-storey commercial structure.